Written by Colleen Sedgwick on June 14, 2018 . Posted in Multiply. This week, we are focusing on how to conquer overwhelm, getting all of those dastardly tasks and things we need to do out of our heads and start taking action on them so we can move our business forward. I’ve been noticing a very common denominator among the pet-sitting business owners I speak or work with. And it’s something that most business owners struggle with at one point or another. It happens when you’ve got so much going on that you can’t see through the trees! Most likely, you’re out still walking the dogs, taking care of the pets, and you don’t really have a whole lot of time to work on the business. That’s when overwhelm kicks in. When you start feeling overwhelmed, you might want to give up. But don’t do that! I’m going to show you how to push through to the other side and avoid burnout. 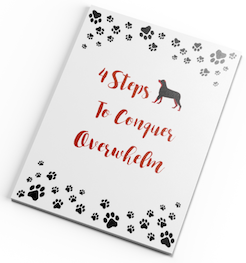 Here are some concrete tips on how to overcome your overwhelm, conquer that overwhelm, really start focusing on moving your business forward and reach the goals you’ve set for your business. The first step is to get everything out of your head. You want to do a total brain cleanse. Just go ahead and dump everything. Every single thing that you can possibly think of – get it out of your head and get it on paper. Below this video, I’m going to link to some awesome dry erase sheets that you can put up on a wall and write everything down. If you have a whiteboard, use it. If you prefer doing it on your phone, or in your notes, do that. You can use a mind-mapping tool like MindMeister if that works better for you. A notebook works great. However you do it, just get it out of your head and onto paper. 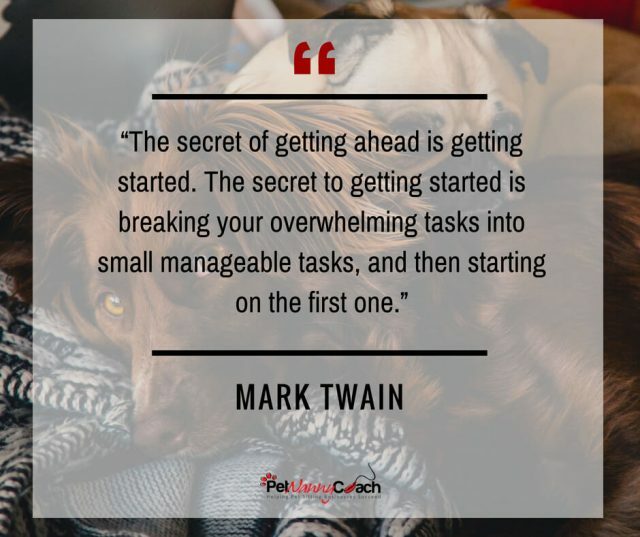 The second step to conquering overwhelm is to organize everything you wrote down into projects. Then beneath the projects, list out the steps that need to take place for you to complete the project. You might end up with five or six projects in front of you. Next I want you to prioritize the projects you created. What are we going to do first? What comes second, third, fourth, fifth, and sixth? Now that you have everything that used to be floating around in your head written down, organized and in order, you are going to actually schedule these into your calendar. Take the time to write everything down. Walking around with everything competing for bandwidth in your brain means you are much less likely to get it done. Get it out of your head and start working on those projects that you’ve wanted to get done for a long time. I know you can do it! And if you like this video, like it, share it, and subscribe to the channel!